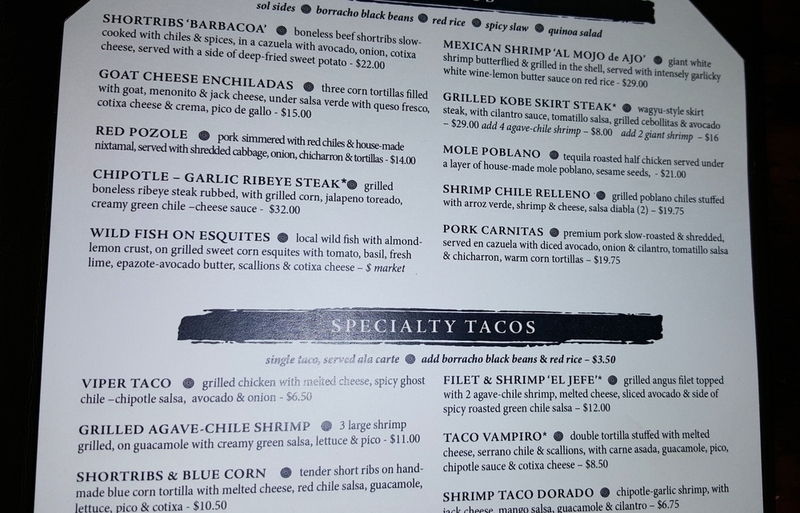 Recently I was invited to SOL Cocina as an introduction to the new menu. This spacious restaurant located in Scottsdale Quarter boasts an upscale menu of Baja-inspired cuisine in a setting of warm rustic colors with a large open kitchen with counter seating, an open-air bar, and patio. Executive Chef and author Deborah Schneider's dishes are a modern take on traditional coastal Mexican with a focus on fresh seasonal ingredients. New additions to the menu feature seafood such as scallops with mango and jicama or a grilled agave-chile shrimp torta, vegetarian items of goat cheese enchiladas with salsa verde or spiced butternut squash tacos, and hearty fare including a 12-ounce grilled ribeye rubbed with garlic and smoky chipotles in adobo. Our friendly server Taylor brought crunchy seasoned tostadas with flavorful salsa and bean dip, and also a condiment trio of juicy wedges of lime, chile de arbol and habanero salsa, and salt. The fiery arbol and habanero salsa was my favorite and I ended up using it to spice up my dishes throughout the night. Our first order were grande margaritas, of course. A Cadillac Margarita for my husband with SOL’s house-made sour mix, Partida Blanco, orange juice and Grand Marnier, and for me the Casa Noble Reposado Margarita with SOL Single Barrel Reposado tequila, custom blended at Casa Noble’s distillery annually and exclusive to the restaurant. Playa oysters are part of the new menu and they were just as good as described - plump oysters broiled with queso meñonita, chorizo, and garlic butter. The shortrib barbacoa was my main course and for my side I chose grilled corn with cotija cheese, ground ancho chile and lime. Served with warm corn tortillas, the cazuela was piled high with tender slices of braised short ribs and accompanied by crispy sweet potato wedges and taco toppings of guacamole, onion, and cotija. 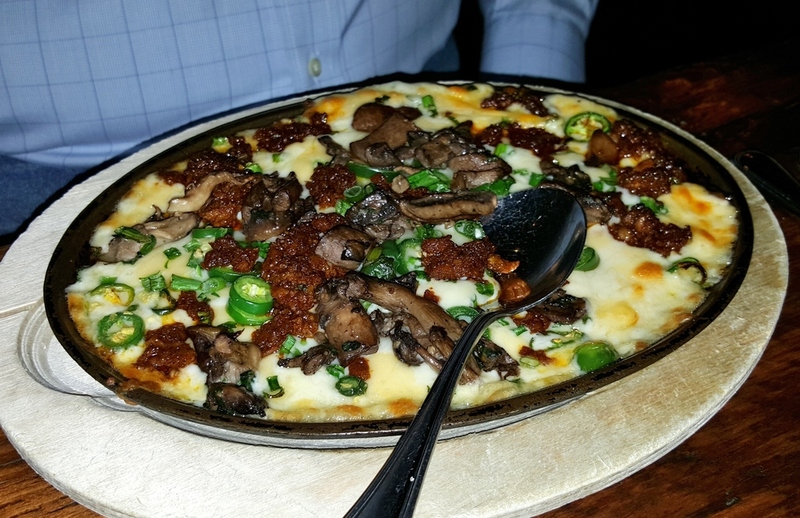 My husband opted for queso fundido as an appetizer and the version at SOL Cocina is one of the better ones we've had, with the gooey cheese generously topped with crumbled chorizo, mushrooms, and sliced serrano chiles (leftovers were great taken home and used in an omelet). His favorite Mexican dish is mole poblano so he was happy to see it on the menu at SOL Cocina. Here, this deep rich sauce is used to blanket a juicy half chicken roasted with tequila, with his choice of two sides being avocado and tomato salad and spicy slaw. When I saw that a dessert making its debut was Pastel Tres Leches ‘1921’, I knew what I was going to order as a finale. I'm a big fan of tres leches, a traditional Mexican treat. Tres leches means "three milks" and is a cake soaked in three kinds of milk: evaporated milk, sweetened condensed milk, and heavy cream. At SOL Cocina, their version is made even more decadent with the addition of 1921 tequila liqueur and spiced with cinnamon and vanilla. The crowning touch is an addictive marshmallow meringue - be sure to get a dollop in every bite. As I sipped on a mezcal, we made plans for a return visit when my parents visit later this month. I think the patio on a sunny day will be the perfect spot to entertain family visiting from snowy Massachusetts, or perhaps we'll grab a table on Taco & Tequila Tuesday when SOL offers special discounts on tacos, tequila, Mexican Beer, and margaritas all night long, with live music. I was hosted by SOL Cocina and our meal was complimentary.